Harlem Globetrotters in Montreal or Quebec City? Inform me about the next events for Harlem Globetrotters. Enroll yourself to our priority waiting list for Harlem Globetrotters to be alerted when new tickets are available. Filling this form doesn't engage you to any purchase. Harlem Globetrotters will be stopping by the Place Bell, in Laval, on March 30th 2018, and the next before, March 29th, at the Montreal Bell Centre during their Canadian tour which will visit 21 cities. 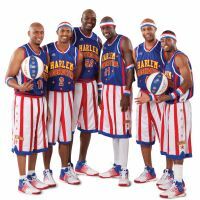 Since 1927, the Harlem Globetrotters travel throughout the world to amaze the crowds with their exhibition games. The current team is no different than the previous ones, with the charismatic Kevin "Special K" Daley, and his lovable giant teammates.